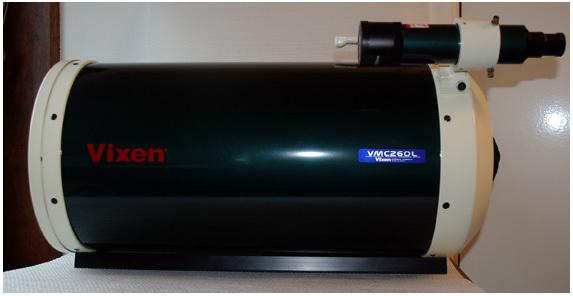 Here are some pictures of my Vixen VMC260L that I acquired in 2006. Images of the Moon and Planets that I made with this telescopes can be found in the other sections of this website. 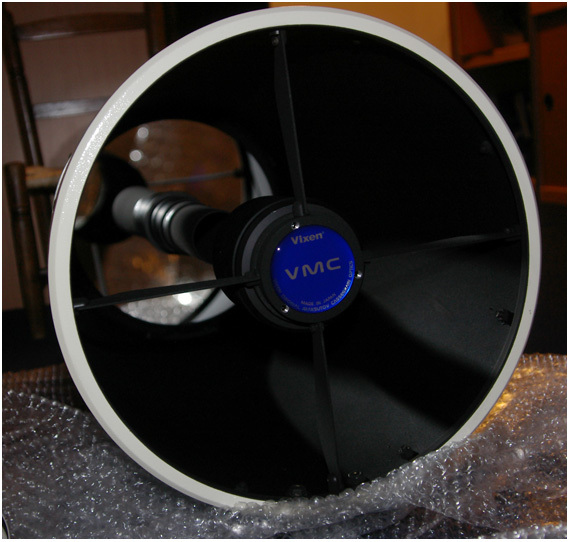 The VMC260L is a Maksutov-Cassegrain with a sub-aperture corrector in front of the secondary. The 260 mm diameter primary mirror is spherical, abberations are corrected by the secondary and the lens-system through which the light passes twice. The resulting F/D as given by Vixen is f/11.5 giving a focal length of 3000 mm. 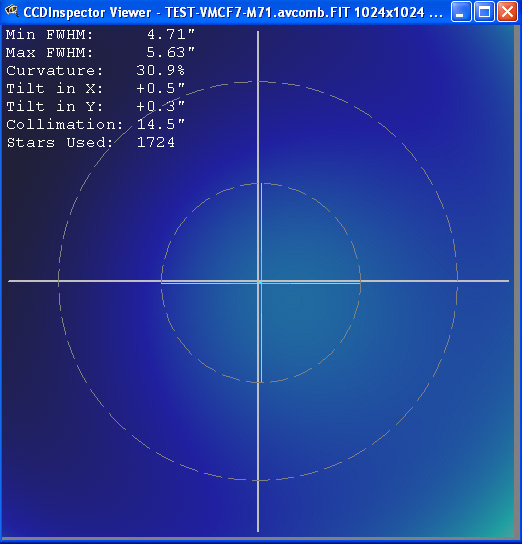 However, as with any Cassegrain system with moving mirror focusing, the focal length is variable! 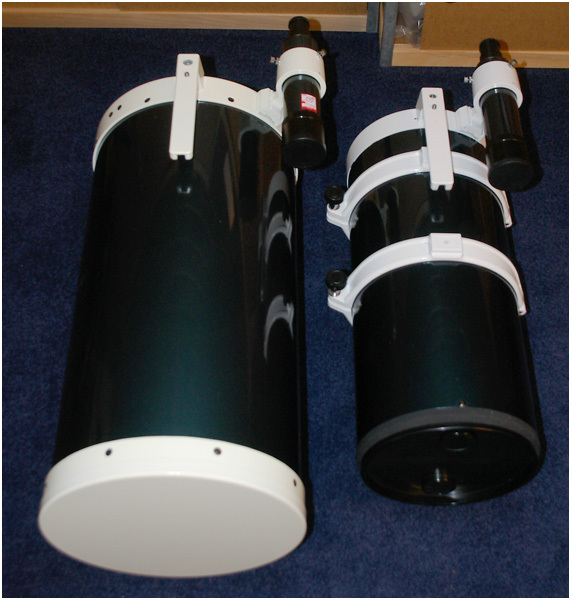 You can find some information about this telescope family on http://www.telescopes.ru/articles/article5.phtml . Orion Optics in the UK now also has a few telescopes according to this design. The optical and mechanical quality is better than with the mass produced SCT's. The open tube cools faster than a closed SCT or Maksutov telescope. Drawback is that the main mirror is exposed more to the elements, but that is the same for the Newton telescope design. As with Meade and Celestron SCT's you can only collimate the secondary mirror on this telescope. When collimated, the telescope shows a good image and nice concentric diffraction rings, however due to the design these look somewhat different (more diffraction) because the secondary is supported by 4 vanes and probably because of the corrector in front of the secondary mirror. The vanes are thick but this needed as the secondary mirror and lens assembly is quite heavy. The telescope keeps collimation quite well. 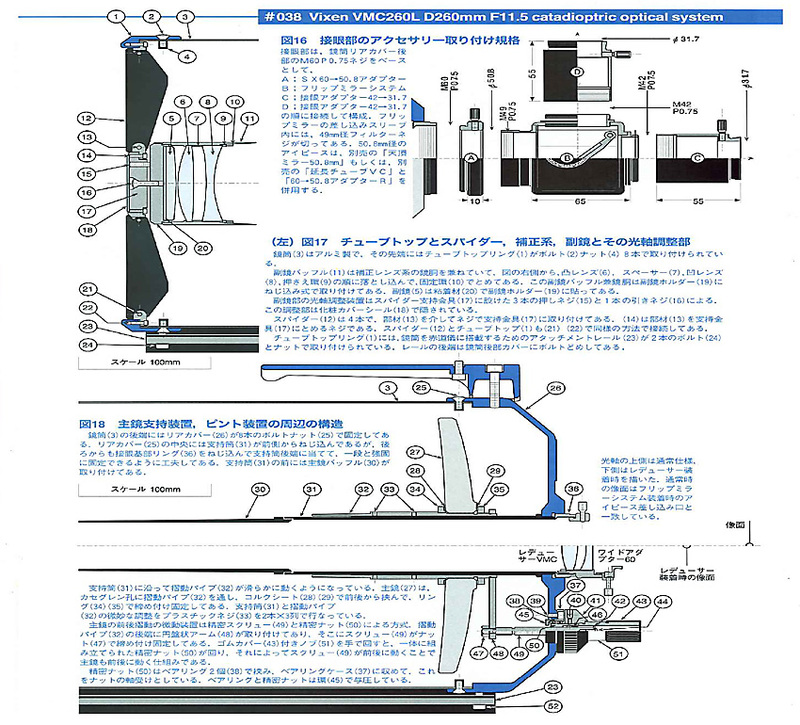 Below is a drawing of the VMC260L that I received from Vixen Japan. Remark the two lens corrector in front of the secondary mirror. The focusing system using a moving primary is basically the same as in the Meade and Celestron SCT's but the built quality is better. The drawing also shows the optional reducer-corrector preferably used for deep-sky photography as it reduces f-ratio and flattens the field. 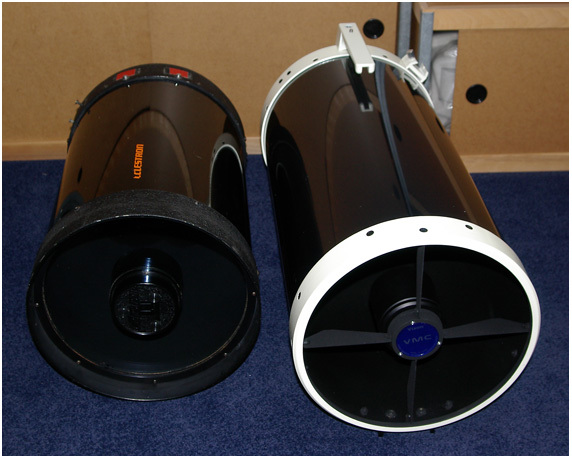 The VMC26L besides Celestron C-11 and a VC200L. The tube diameter of the VMC260L is the same as of the C-11. 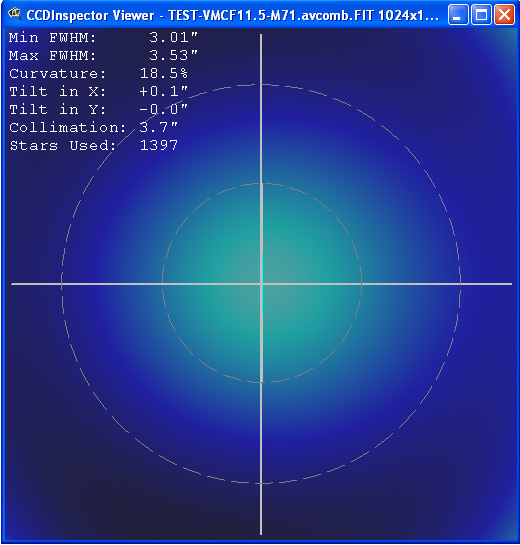 Below is a CCD Inspector graph showing the field curvature of the VMC260L with the Vixen VMC reducer and my SBIG ST-10XME. 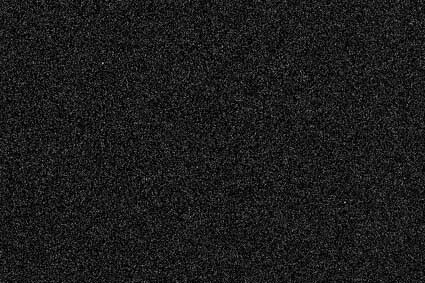 I also made test images with my SBIG STL-4020 CCD camera (chip size 15x15 mm, I used 2x2 binning for these images). 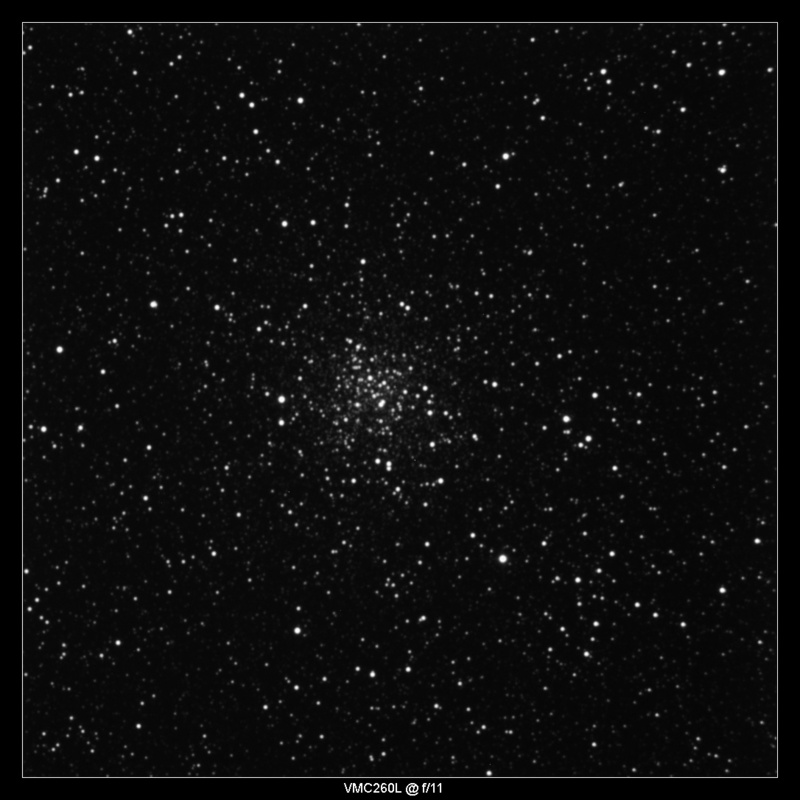 The one without reducer-corrector was checked in The Sky and shows a f-ratio in the used configuration of f/11. 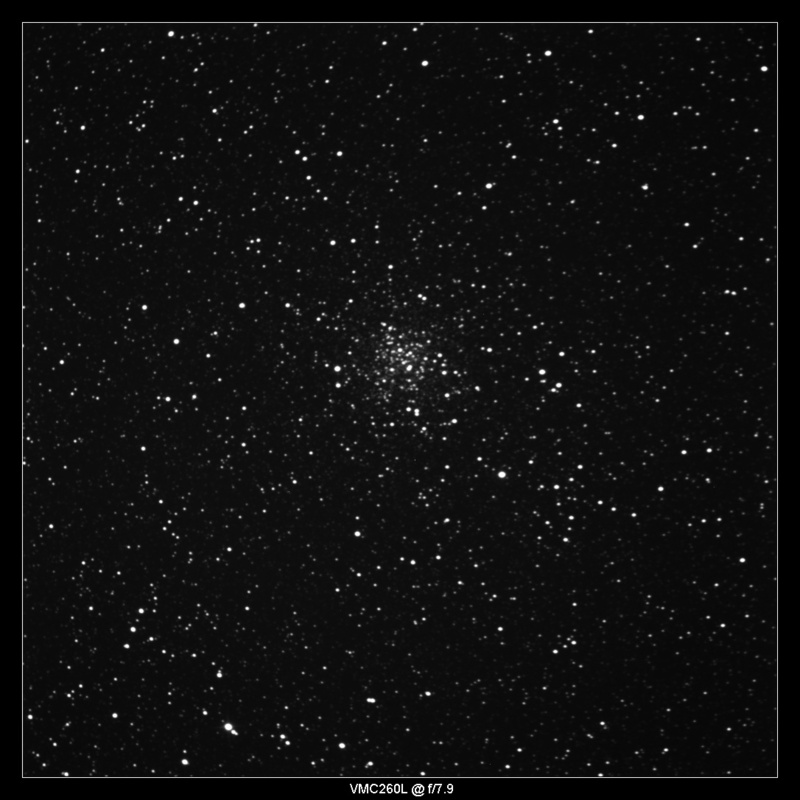 The one with reducer-corrector was also checked in The Sky and shows a f-ratiion in the used configuration off- f/7.9. 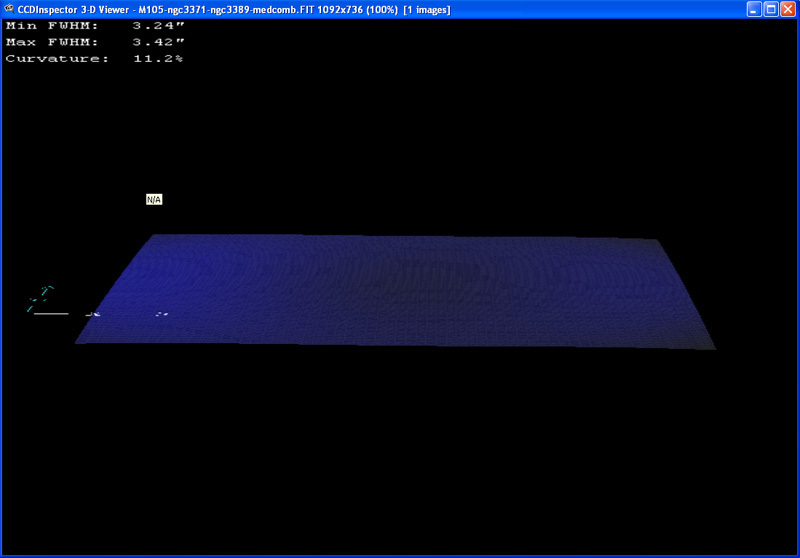 The images only received dark subtraction, no correction with flat field images. The images are made of 3x 5 minute exposures and show Messier 71. The curvature of the field, especially at f/11 can vary somewhat depending on where a star is placed for focusing. 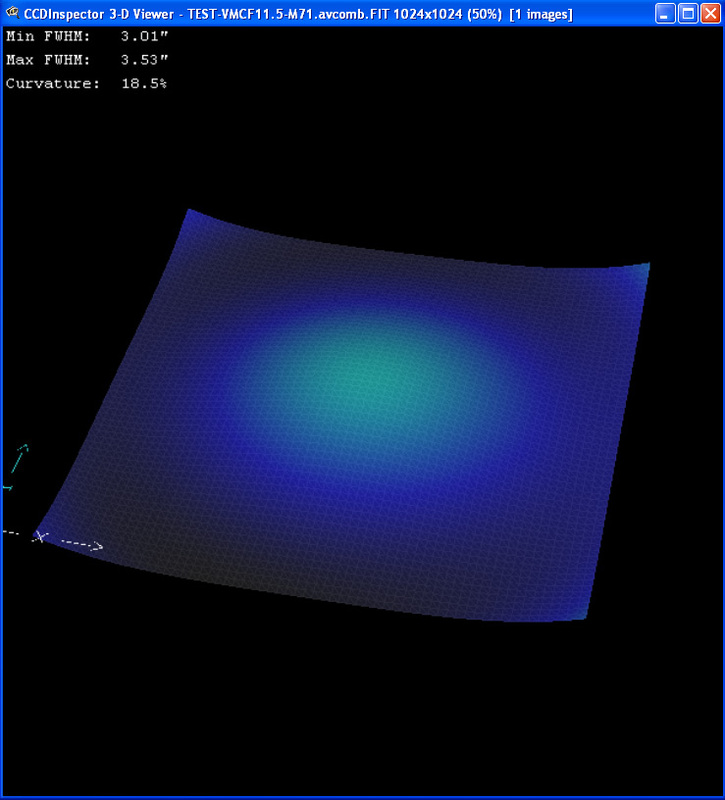 For these test images, the star was centered. 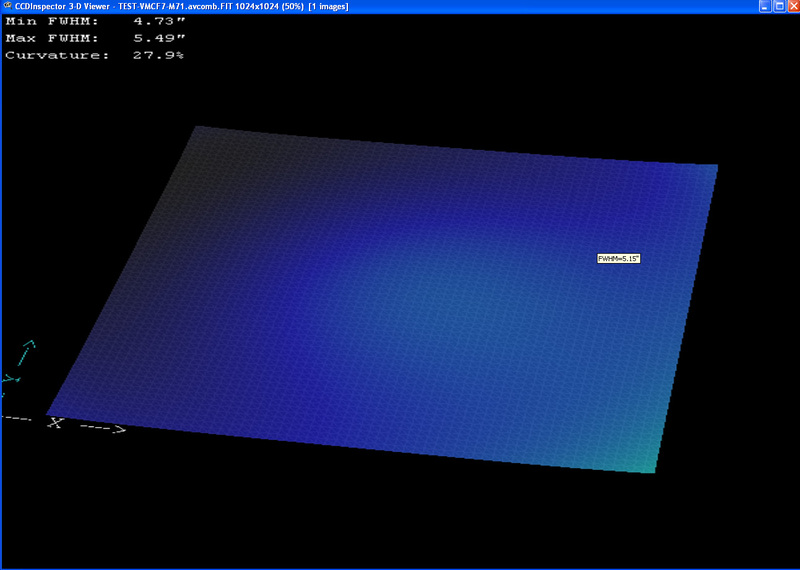 Flat field images will certainly remove any uneven lighting effects observed in the images. Allthough the f/11 configuration shows some elongated stars in the corner of the 15x15 mm CCD chip, it is well usable to image small objects (e.g. planetary nebula) provided seeing and guiding are good. Mirror Shift and Mirror Flop. Compared to some other commercial SCT's the mirror flop when the telescope is slewed through the medidian is very well contained to acceptable levels in this telescope. 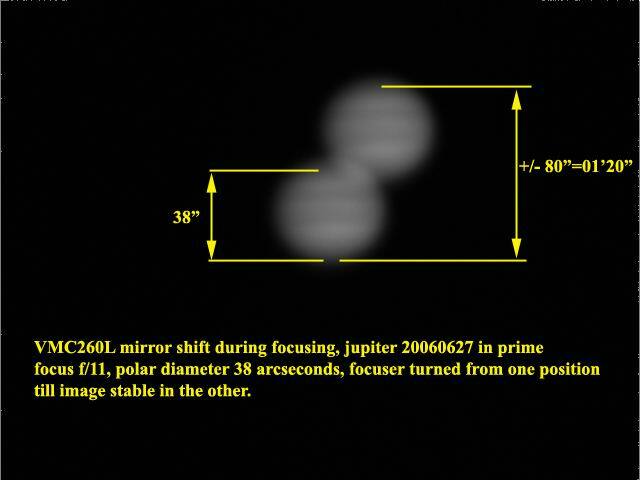 As focusing is done by moving the primary mirror, there is still some inevitable mirror shift when changing focus direction. 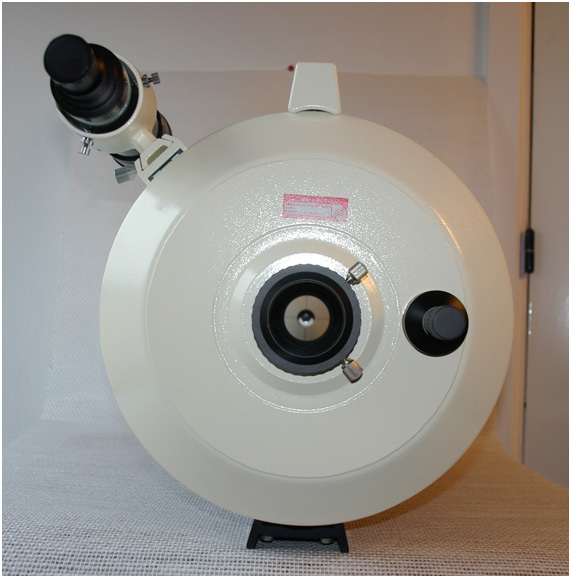 So for high magnifacation planetary imaging an external focuser is recommended. For visual observing this is not an issue at all.